Where Open Water Swimming becomes your friend… Leave your struggles and your competition behind you… Helping you to bubble, bubble, breathe with confidence!!! DATES: Phase 1 -> Tues 10/1/17 to 18/4/17 inclusive. VENUE: Coogee Beach Netted area. Carpark north of Coogee Beach Cafe, turn in off Powell Road, Coogee. TIME: 6am start & 7am finish. 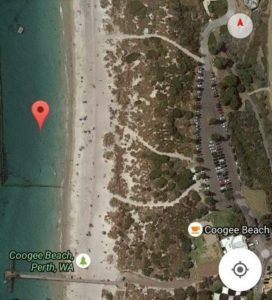 INFO: We meet on the beach 100m north of the Coogee Jetty at 5.55am for our prompt start. 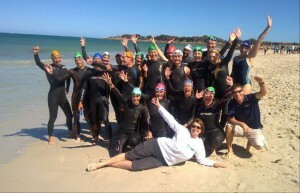 With wetsuits at your waist, we head out for a very brief warm-up jog, then hit the water for a warm-up swim, followed by designed circuit swims. **Walk down to the meeting area on the beach either directly from the cafe or the 1st walkway north of the cafe. NB: One off walk-ins on the day are always welcome… at $20 cash per person. Any further enquiries email headcoach@OpenWaterSwimmingMastery.com or call Head Coach Shelley directly on 0414 594 245 so you don’t miss out! PS: Just imagine overcoming your technique AND mental barriers to faster times AND more enjoyment! From panic to calm & relaxed state… I now enjoy OWS so much!!! From last (literally) to 3rd in my age category and 5th overall!!! “Shelley, with your help, it has created a new confidence in the water for me. I have since swum in the pool continuously for 1500m in 45min. That might not sound like much to a champ for me but that was huge, since last year I struggled to get to the end of the 50m. I n the Australia Day triathlon in the Swan River, our “friends” (the jellyfish) were present but were so fun that I ended up getting 3rd in my age category for the swim (5th overall). I’m normally the last out of the swim (literally). I am super happy and have the half ironman in Busselton and would not have entered otherwise. Words really can’t express my gratitude to you.Thank you.” Maren Kate Scriven, Perth, Western Australia.